Personal items belonging to the McFeely family being removed from their house yesterday. TODAY MARKS THE deadline for bankrupt developer Tom McFeely to vacate his Ailesbury Road house. Mr Justice Michael Peart last month rejected postponing the possession order which called for today’s move. The house, in Ballsbridge in Dublin 4, had a mortgage of €9.5 million taken on it in 2005. 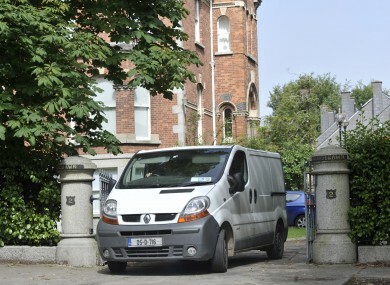 Photographs which were taken at McFeely’s residence yesterday show the clearance of personal items from the premises. Email “In pics: D-Day for bankrupt developer Tom McFeely”. Feedback on “In pics: D-Day for bankrupt developer Tom McFeely”.